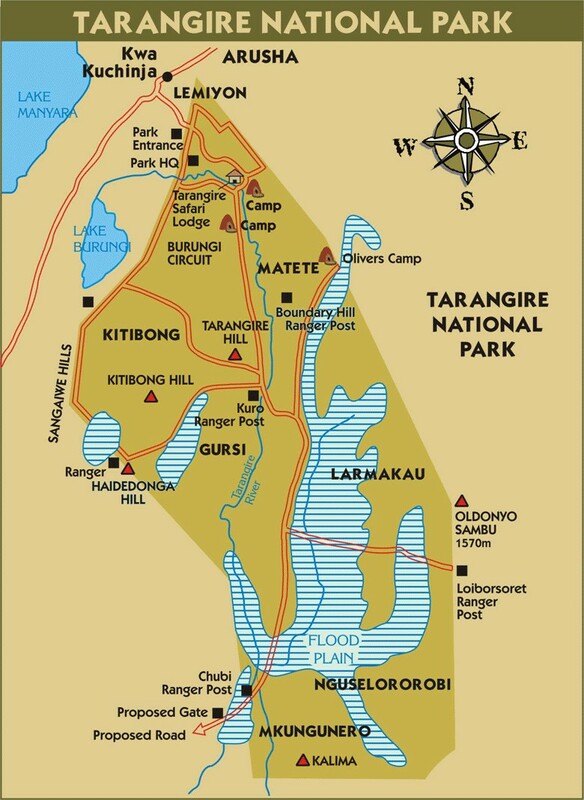 Tarangire National Park is the sixth largest national park in Tanzania. It lies a little distance to the south east of Lake Manyara and covers an area of approximately 2,850 square kilometers (1,100 square miles.) The landscape and vegetation is incredibly diverse with a mix that is not found anywhere else in the northern safari circuit. The hilly landscape is dotted with vast numbers of Baobab trees, dense bush and high grasses. The name of the park originates from the Tarangire river that crosses through the park, being the only source of water for wild animals during dry seasons. During the dry season thousands of animals migrate to the Tarangire National Park from Manyara. The park is famous for its huge number of elephants, baobab trees and tree climbing lions. Visitors to the park can expect to see any number of residentzebra and wildebeest in addition to the less common animals. Other common animals include waterbuck, giraffe, and olive baboons.